After coming down from Canada, which I never regretted, I gained a lot of experience from the teachings with Robert and observing how he came up with his own techniques. Following his steps gave me the confidence for making my own decisions if I encountered a difficult situation. I can honestly say, by day 5, you will be guaranteed to apply window tinting to ANY vehicle. 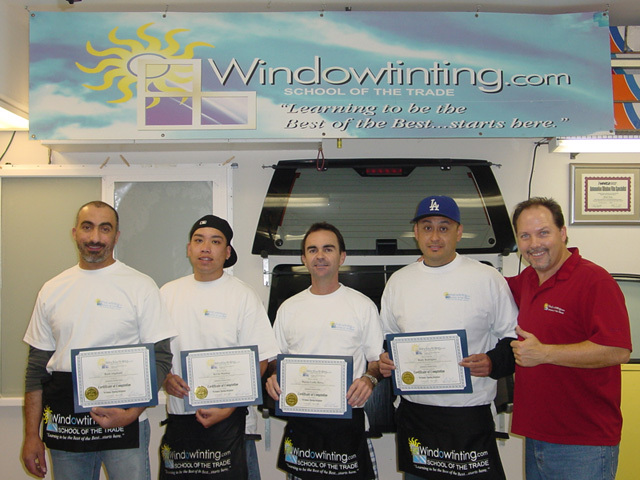 This course was really informative and it taught me a lot more about window tinting other than just the application itself. Our instructor, Robert, was really helpful and clear with all the lessons not to mention was a very entertaining person; which made class time" never boring!" Coming from Vietnam was worth every penny! The knowledge shared is empowering and very professional. The training environment added enjoyment in the over-all learning process. I acquired the confidence in practical rules and the proper steps. The film and tools we were given were of high quality and easy to work with. I personally was very satisfied with the clean and professional finished results from the methods we were taught. Robert is an excellent instructor! He makes class-time fun and has plenty of great knowledge not only about the tinting industry, but life itself…you can't beat this course!! !